Fine Art Limited Edition of 10. Only 3 copies left. 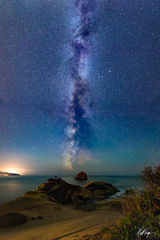 In this nightscape fine art photograph, the great Milky Way Galaxy rises above Cape Kiwanda on the coast of the ocean near Pacific City, Oregon.This photograph represents almost a full field of view of the night sky including stars from horizon to horizon. I waited at this spot until 1 AM to capture the Milky Way in alignment with Kiwanda Rock on the shore of the beach. Bioluminescent algae shined through in the darkness on the shores of the rock - creating a super dynamic scene.